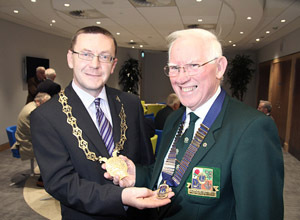 THE Downpatrick Lions are celebrating their successful 40 years of supporting worthwhile charities through their determined efforts and have been recognised by Down District Council at a anniversary reception in the new Down Civic Centre. Down District Council Chairperson Councilllor Mickey Coogan, left, congratulates Mr Sean Carvill, President of Downpatrick Lions Club on 40 successful years. Councillor Mickey Coogan, Council Chairperson, has praised the role of Downpatrick Lions Club in contributing to the health and wellbeing of citizens across Down district and in Third World countries. On Wednesday 21 November almost 30 dedicated volunteer members of the Downpatrick Lions’ branch of the international community based organisation attended the special reception. Speaking at the event, Councillor Coogan said: “On behalf of Down District Council and the citizens of Down District, it is my great honour and privilege to extend our heartfelt congratulations on your 40 years of distinct service to the people of Downpatrick and beyond. The work undertaken by your members has not only grasped the challenges we face in our communities, but has also generated encouragement and support from local businesses which aid projects locally, nationally and internationally. 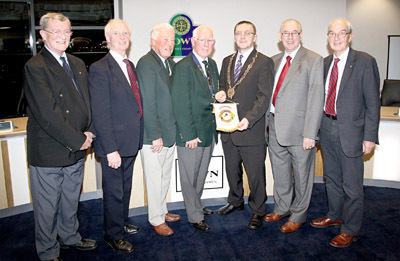 Council Chairperson Councillor Mickey Coogan, third right, with five of the remaining seven Charter Members of the Club with President Sean Carvill, centre. From the left Lions Terry Torney, Peter McKenny, Fergus Kelly, Vincent Murphy and Graham Dickson. 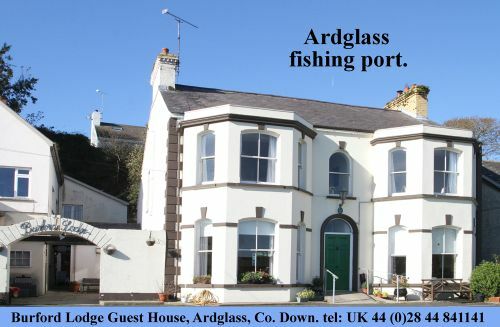 Absent from the picture are Downpatrick Lions John Riordan and Cecil Johnston. 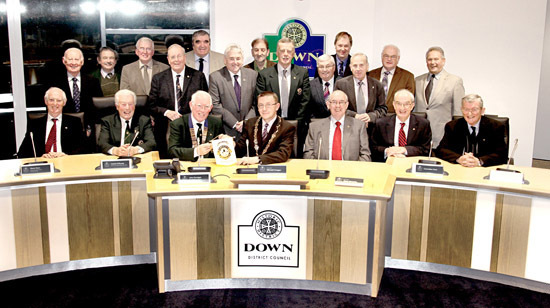 The Downpatrick Lions’ branch produces a talking newspaper, entitled ‘Downsound’ which is vital to those with visual impairments to help them keep up to date with all the local news. Other projects which benefits from the donations raised by the members includes a grant aid scheme to support the development of young people, activities aimed at helping vulnerable and marginalised groups at home and abroad. Charitable organisations and overseas disasters have also received financial assistance from the Downpatrick Lions. The members also organise a monthly get-together for senior citizens where activities include storytelling, bingo and musical entertainment. Mr Sean Carvill, President of Downpatrick Lions Club, thanked the Chairperson for his invitation to the anniversary reception, and said: “This year is a milestone year for our club and we consider the invitation to the beautiful new Council Chamber and to have our work recognised by the Chairperson of Down District Council, the First Citizen of our District, to be a particular ’Milestone Event’. Mr Carvill concluded by thanking the Chairperson, elected members and Council staff, past and present, for their support and assistance given over these past 40 years. Councillor Mickey Coogan, Down District Council Chairperson, welcomes the Downpatrick Lions Club to the new Council Chamber as part of their 40 year anniversary celebrations.